NetBeans has good support for editing Maven pom.xml files. For example we have code completion for the different elements in the pom.xml. 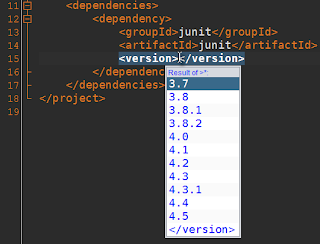 But also context sensitive code completion to look up group, artifact or version for a dependency for example. The following screenshots show the code completion NetBeans offers for these elements. Each list of options depends on previous selections we made. Notice we only get artifacts for the group junit, and only the versions which apply to group junit and artifact junit.